Call Us For A Guaranteed Low Price! Mosmatic's 21" Professional Series Surface Cleaner has all the bells and whistles for the professional power washer. Height adjustable for easy cleaning. Also comes with a 30" spray wand and holder for hitting those tight corners, edging, or gum. 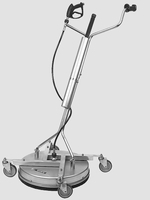 Four large casters make maneuvering the surface cleaner extremely easy.